Albert Rosenthal was born in Sighet, Transylvania, a region of present-day Romania. In April 1944, when Albert was 19, he was imprisoned in the Sighet ghetto along with his parents, sister, and other Jewish residents of the town. His brother was already serving in the Hungarian army at the Russian front. From the ghetto, Albert and the rest of his family were deported to Auschwitz, where Albert's mother was killed shortly after their arrival. At Auschwitz, Albert and his father volunteered to work in a labor camp in Wolfsberg, Germany, where they remained for eight months. Albert managed to get a job cleaning German officers’ quarters located just outside of the camp, where he was able to steal small amounts of food for himself and his father to supplement their meager rations. After he was caught stealing, he was sent back to work in the camp, where he again found a job that afforded him surreptitious access to food, working as a night nurse for one of the leaders in the camp. Albert worked in this capacity until Russian forces approached the camp. In January 1945, as the Germans fled, the prisoners were forced to march out of the camp. Albert and his father ended up in in Bergen-Belsen concentration camp, where Albert’s father became ill; he died on Passover eve in April 1945. Albert survived by volunteering to drag bodies of dead prisoners to the mass open graves until he, too, fell ill. The camp was liberated by British forces on April 15, 1945, and he was moved to a hospital under British control in Bergen. From there, he was taken to Sweden by the Swedish Red Cross for three more years of treatment. 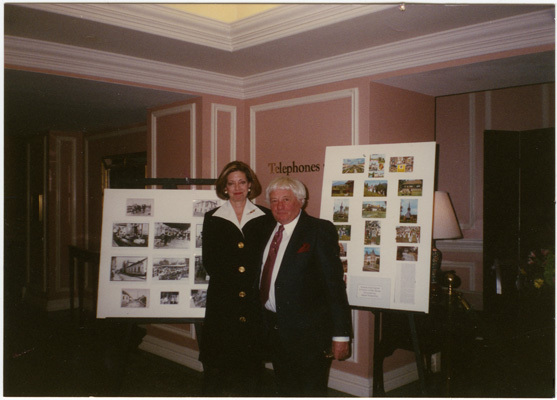 This photograph shows Albert Rosenthal with Eileen Chepenik at a Charleston Jewish Federation campaign event at the Charleston Place Hotel. This event, held in late 1995 or early 1996, featured Elie Wiesel, a native of Sighet, as is Albert. Albert prepared an exhibit of postcards and photographs from Sighet, and it was displayed outside the ballroom where Elie Wiesel spoke.